The Amsterdam Jazz Connection (A.J.C.) is a Dutch project, founded in 2010 by Joost Swart (piano), Sebastiaan Kaptein (drums) and Jeroen Vierdag (bass). The trio worked intensively together in Holland in different projects (Jesse van Ruller, Francien van Tuinen, Benjamin Herman) and performed at renowned venues as the Bimhuis, at festivals like the North Sea Jazz festival as well as many clubs and festivals abroad. After a first succesful tour in Japan in 2010, the A.J.C. recorded their first album ‘Live in Jazz Cafe Alto’ with guest Benjamin Herman on alto sax. It was released by Tokyo based record label ’55 Records’ in 2011 and another Japan tour took place in the same year when the A.J.C. featuring Benjamin Herman performed on the prestigious Tokyo Jazz festival and many other places throughout the country. In March 2014, the A.J.C. recorded a 2nd CD featuring highly talented and sought-after trumpet player Rik Mol. The music can be described as organic, energetic, with search for freedom, respect towards the jazz history though with an wayward Dutch flavor. 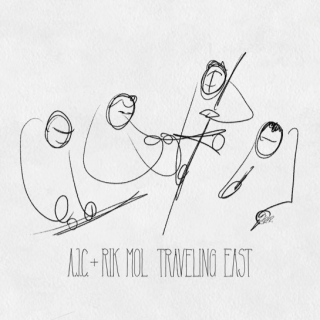 The CD ‘TRAVELING EAST’ is to be released this summer.